The 2017 Gongfarmer’s Almanac Volume 4: Pandemonium Setting: Dark Seas, was written by Paul Wolfe. Artwork is by Doug Kovacs, Marc Radle, Mez Toons, Paul Wolfe and Old Book Illustrations. The publisher is the Gongfarmer's Local #282. Unlike previous years' Gongfarmer's Almanacs, five volumes of the 2017 edition have an overarching theme - the roiling, ever-changing plane of Pandemonium. This volume describes a single campaign setting, only nominal linked to Pandemonium. Apart from the excellent Zine Indexes by Jon Hershberger, I believe that this is the first Gongfarmer's Almanac volume produced that is the work of a single author. The material is described as a "DCC rip of Sunless Sea". "Far beneath a shattered world lies an underground ocean of unfathomable depths in perpetual night and crawling with ancient beasts. You are not heroes – you are sailors on a wine-dark sea, chasing the secrets of the past scribbled on ancient pages or scattered across a thousand fragments and running from the constant threat of madness. Captains of iron steamships cut across the Undersea armed with powerful carbide lamps, deck guns, and other weapons to ward off the night, as well as the creatures and pirates that lurk there. Beings of Stone, Salt, and Storm aid or hinder you, or laugh as your vessel sinks below the black waves. Out there somewhere – in the ports, ruins and wilds that cling to small rocky islands – are the formulae that could save humanity. Or doom them to lives of gibbering insanity." Optional Character Generation: Characters start penniless, only gain XP by learning and disclosing secrets, and choose allegiances to Salt, Stone, or Storm for alignment. You will need to read Appendix C to understand exactly how character generation has changed, though, and frankly should read all of the appendixes before proceeding with the adventure. Betrayal at the Admiralty: A 0-level funnel for Dark Seas. Characters begin play press-ganged into service, but quickly assume greater responsibility on the steamship Queen’s Sword. Secrets lurk in every cranny of the ship and on every darkened rock that clings to uncertainty. Will the characters find out who threatens the Admiralty and Londonia’s sovereignty? Judges are warned to dive into the appendixes of this volume before tackling the adventure. The adventure is flavorful, though, and does an excellent job of evoking the feel of the setting. Locations on the Undersea: Short, evocative descriptions of places PCs may visit, with both a judge's and a players' hexmap. Paul Wolfe has done a very good job providing the flavor of each area, as well as the details that will allow a good judge to bring it to life. XP in Dark Seas works via secrets, so the author gives you plenty of examples! Appendix M: NPCs or...So, What's the Mystery? : This appendix is really part of the adventure, but the Crime and Motive portion may be useful for judges crafting future mysteries. 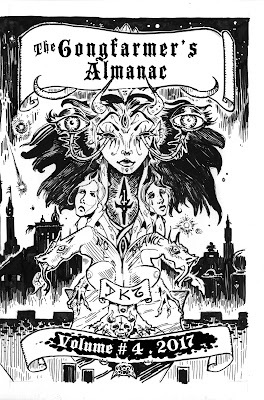 Appendx C: Creating Characters: The author writes "Character creation for the Dark Seas campaign is generally the same as any DCC RPG game", but there are enough differences that this should have been a section before the adventure. Certainly, the judge will need to understand and communicate the changes to his players. All PCs start with a contact and an initial secret ("something that the character knows that drives them to seek out more dangerous knowledge"), which replace the typical Lucky roll (birth augur) from the Dungeon Crawl Classics core rulebook. Race is separated from class, and saving throws change. While the changes to saves are mostly cosmetic, the ability to choose the highest of two stats to modify saves and the inclusion of a Terror save are significant. Appendix S: Steamships: "Though 0-level characters start out as simple crew — often attempting to survive their first mission to uncover secrets for someone more powerful than they — upon gaining 1st level, the party receives its own steamship." The rules for steamships are simple, intuitive, and evocative. Importantly, terror plays a part in these rules, as does resource management, and these two elements influence each other. Eventually, someone is going to put together a naval guide for Dungeon Crawl Classics, and hopefully elements from this issue, as well as Tales From the Fallen Empire and Crawl! #11 are considered. Appendix W&E: Weapons & Equipment: "Dark Seas is set in a fantasy Victorian/Lovecraftian post-apocalyptic place where society has retreated underground to a vast, unfathomable sea. Equip accordingly." The inclusion of Heavy damage, and fairly extensive tables for goods and cargo, are definitely welcome. "Some targets such as ships, giant creatures, and the like, can only be damaged by heavy damage. If a character or other relatively normal-sized creature is struck by a weapon that deals heavy damage, the damage dice are trebled. Normal firearms may harm creatures that can only be injured by heavy damage — each 10 points of normal damage deals 1 point of damage to a giant sea creature. Ships and other vehicles may not be harmed by normal firearms." The issue is rounded off with a Sample Steamship sheet, and two pages of "two-up" Dark Seas character sheets, suitable for 0-level play. Having one of these pages be a regular Dark Seas character sheet would have been ideal, but the way the pages lay in the print spread allows you to photocopy any number of four-character sheets for an introductory funnel.